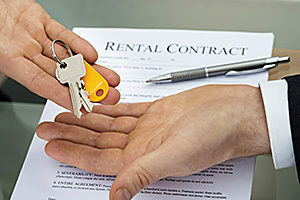 Signing a Lease and Tenant Move In Costs, Can I Rent My Property? Our journey has taken us from determining market rent, to ensuring our rental property is “rent ready” and will attract the best renters, to advertising our rental property for rent, to signing a lease and tenant move in costs. Let us now look at what the process of moving people into the investment property should be. In the beginning of the process you were advised to obtain a state compliant lease for your rental property. Make sure you have read and fully understand your lease and all of your and your renter’s responsibilities with regard to the lease. Your new renters will look to you, as the owner, for explanation of the lease and key terms and dates will need to be clear and concise. This lease signing time will also allow you the opportunity to set “house rules” with regard to items not specifically spelled out in the lease such as city noise ordinance times, changing of filters and lightbulbs, maintenance responsibilities or any special neighborhood or Association rules. Once the lease is signed, a move in evaluation should be performed with the resident noting any items that are damaged (whether or not they are going to be repaired should be noted), and condition of the home. This is a good time to note make, model and serial numbers for appliances and size and number of filters and batteries needed for future reference. It is also a good idea to ensure your new residents know where the breaker box is, water shut off and how to operate sprinklers, garage door openers etc. Done correctly this process should take approximately two hours of your time. This should almost complete the lease and tenant move in costs for you. The last step in this process is to actually give a set of keys and all other openers to the home to your new residents. This is important, do not release keys until the lease has been signed, monies due are collected and the walk through evaluation has been completed as the exchange of keys signifies change in residency. Once this exchange takes place, you no longer have the right to come and go from your rental home but must give your new residents the State mandated notice before entering. Make sure the new residents have the means to reach you in case of emergency and know where and when to pay the monthly rent. Give a handshake and a smile to welcome them to the neighborhood. There are two ways to get in contact with us for your free no obligation in home consultation. Fill out the contact information form on this website and we will call you back shortly, or just give us a call at Citywide RPM in East Atlanta at (678) 641-7368. Citywide RPM – Real Property Management is here for you!